For my third fashion week outfit I felt very"space cowboy" from Cowboy Bebop! Yeah, I've got anime on the brain! So what does a space cowboy look like when attending glam shows in Manhattan? Why this of course! I so adore these pants! The print is called "galaxy" but they're actually inspired from paint splattered concrete. But the definitely give me space age! Add the cowboy hat and tah dah! 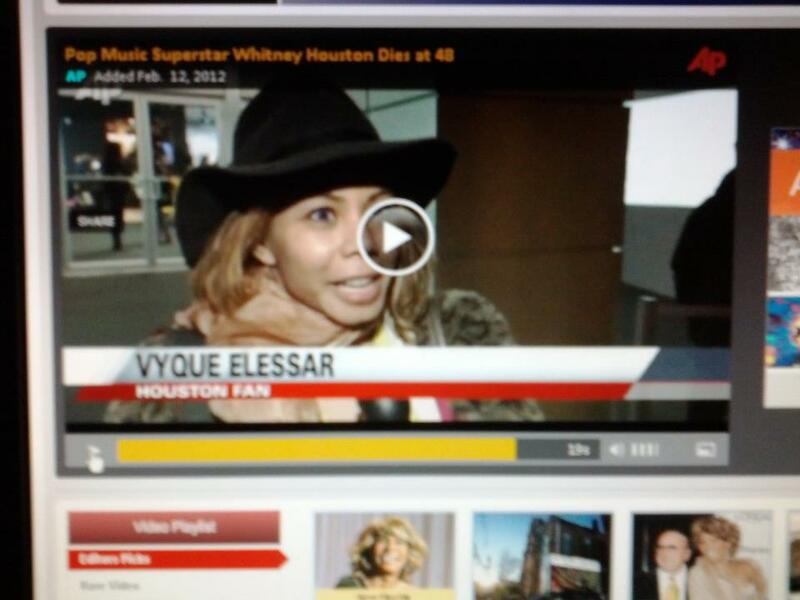 AP interviewed me on camera about Whitney Houston in this look! I had to embellish a bit since I can only think of one song by her, but luckily they edited most of that out! I'm famous!! UPDATE: A longer clip found on YouTube. I'm wearing: Hat & tee from Madewell, LUSH blazer from Nasty Gal, Nicholas K scarf from their recent show's giftbag, Rag & Bone skinny jeans, bracelet from ideeli, American Apparel fingerless gloves. Fierce!!! It was great meeting you at IFBcon!